The credentials and the namespace are correct. 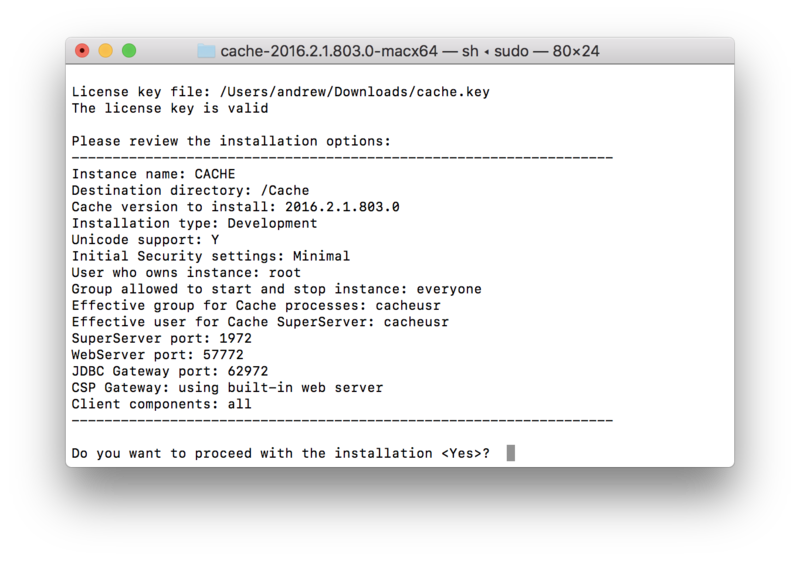 The Cache instance has been initialised correctly and by instruction. All the global environment variables including GLOBALS_HOME and DYLD_LIBRARY_PATH have been set. The jars have been included. From this, I understand that your installation directory is /Cache and /Cache/mgr is the directory of namespace %SYS where System_Management runs. It is where you log in and get directed to SAMPLES by Caché, based on your config file that is then in /Cache/cache.cpf . Caché takes care of it. The program is run by a user in the cacheusr group (or an alternate run-as group if it was changed from cacheusr to something else). The program sets its effective user or group by manipulating its uid or gid file permissions (using the UNIX® chgrp and chmod commands). JNI access is implemented and handled similarly to C++based CallIn. So also error messages are similar. And shdir has the same role as IPaddr:port for TCP connection. I've tried using intersystems provider for jdbc and it's work fine. Below is the sample. thank you for the answer, but I need to access globals and I assume Globals API is the only way to do so. JDBC connections work perfectly. Where do you provide port no? I use the default configuration, and I haven't specified either port or host. Are there any methods to allow to do that? Of course, I read the documentation. "Unlike the standard Java binding, the Globals API does not use TCP/IP to communicate with Caché. Instead, it used a fast in-memory connection (implemented via standard Java JNI and the Caché Callin API), and runs in the same process as the Caché instance." - that's why JDBC connections may work while Globals API calls may not. According to your script sniplets you are working on Mac OSX ? [System Administration] > [Security] > [Services], select %Service_CallIn, and make sure the Service Enabled box is checked. just with a different error code. How can I figure out what -1 there means? It's worth to mention that there are no audit logs when I run the application (though the audit feature is enabled and all system events should be logged. It logs JDBC login/logouts, for instance). The call from this issue https://stackoverflow.com/questions/26104574/issues-while-connecting-to-... was registered, any of my requests wasn't. your connection may also fail if you don't have a free license. TRYCACHE has just one and can't have more. if you have NO licence only 1 user is allowed. In this case log out from any other connection and try JNI. sounds much like "missing license"
I've got a license from my university. It shouldn't be restricted in that way. Where can I validate my license.key if it might be a potential problem? If it's formal valid this should show your license. 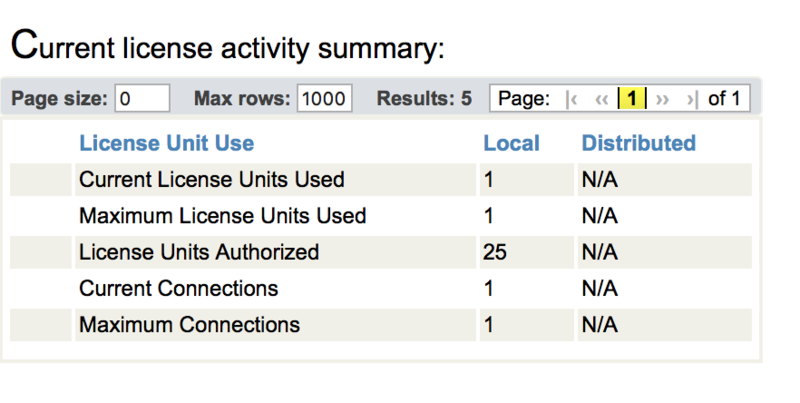 Look for OSX or "platform independent"
if the numbers are reasonable your license is OK. But be aware the free download version IGNORES any license! 25 users, Platform Independent looks good. Licensing can NOT be the problem ! no direct hint .... but CacheSecurerStart is mentioned. But did you try unauthenticated access too ? Yes, I have tried this as well as connection.connect(). I have tried connecting with incorrect parameters. The result is the same. sorry I ran out of ideas. _SYSTEM has role %ALL ; you can't have more. you have no License issue. It means I have two instances, the first one was removed, but it still remains default. I've cleared it, now the system recognises one default instance. 2017.1.1.111.0su S stands for single user and is typically a Trial Version with some limits. 2016.2.1.803.0 is 8bit NOT unicode. 2016.2.1 (Build 803) no U = 8bit. This should not be an issue with SAMPLES, %SYS, ... in your case though....? I reinstalled it again to make sure Unicode support is included. The version though doesn't have `U` at the end. I wonder where shdir is loaded and what the value is. it shout point to your installation. there is an article on shdir in docs. I assume: your JNI connection tried to access the wrong instance using a previous shdir. It's the correct path. The problem is that there is no "previous" shdir. But how can the samples folder be involved in a JNI connection? Yes, that was the problem. My user didn't belong to the cacheusr group. Now it's working. Thank you a lot!!! I'm glad we identified the issue.I have converted the solution into an ANSWER. pls. mark it as accepted so other users may identify the solution at first sight. Andrew, what version of Caché are you running?